The family of Jacob Ostreicher, a haredi man imprisoned in Bolivia, has been caught paying people to fill the gallery at today's Congressional hearing called to criticze the State Department's supposed inaction on the case. The paid stooges were recruited through an ad on Craig's List to fill a "ballroom" in Washington. Apparently placed by an Ostriecher family member, it was allegedly placed on Craig's List in coordination with Congressman Chris Smith's (R-NJ) office. Smith is the Congressman who arranged the hearing and who has, apparently with the cooperation of Ostreicher's family its PR firm 5WPR, tried to turn a Human Rights case into an anti-Obama sideshow. Evidence shows the State Department has tried to help Ostreicher. Another Chabad Diamond Mining Scam? Inspired by the late Chabad-Lubavitch rebbe who "prophesized" that precious stones were "divinely" buried in the area, the firm has been mining for about a decade along the steep hills and lush valleys around Haifa. Jewish Charity Center was developed by a team of marketing professionals who recognized the power of the Internet to dramatically change the world of Jewish Philanthropy and how the public chooses where they donate and which organizations they support. Through a user-friendly interface, the Jewish Charity Center introduces visitors to all the information they need to make informed decisions about where and how they contribute their time and charity. The Jewish Charity Center is designed to usher the ancient commandment of charity into the twenty-first century. To offer you, the visitor, choices and information about how you can help the Jewish Community and Israel. To offer worthy Charities, supporting the Jewish nation and the Jewish people, a platform from which they can tell you, the reader, about their worthy cause. The site lists many Jewish charities, including Agudath Israel of America, Hadassah, NJOP, Aish HaTorah, YU, the ADL, several Federations, the Zionist Organization of America, and others – including at least four messianic ministries whose goal and purpose is to convert Jews to Christianity, Jewish Voice Ministries International, the International Board of Jewish Missions, Maoz Israel Ministries and the Zola Levitt Ministries. None of the listed charities has a working link its own website or to other information about it and no other information about these or any other charities is provided on the site. The purpose of the site seems to be to get people to sign up for a raffle giving away one free trip to Israel – in other words, to harvest email addresses and other contact information of committed Jews. Other than an email address, there is no contact information given and no names of officers, board members, etc. J Media Group provides you direct access into over 100 of the top Jewish targeted newspapers nationwide. J Media Group is a division of Gemstone Communications, Inc., which has been successfully representing grassroots, community based media since 1977. Offering market and publication flexibility combined with complete 360° service fulfillment including a one contact, one order, one invoice system – J Media Group is your partner for Jewish targeted media placement. So what's up with this? Has the American Jewish Press Association sold out to missionaries? I don't think so. I think a group of scammers has found a great way to get the contact information and perhaps credit card numbers of a very valuable group of people. What will they do with this list? <s>We may never find out</s>. UPDATE: I contacted several Jewish charities listed on the Jewish Charity Center site. None knew about the site or were involved with it in any way. Eventually, after several tries, I was able to get the head of the J Media Group, Jess Dolgin on the phone. The site is a for-profit site intended to promote Jewish charities. Any charity can pay to have a listing. That listing will include either a link to that charity's website or a link to a webpage created by J Media for that charity – the choice is the charity's. The page listing Jewish charities is not the paid section of the website. It will not contain links to these charities. J Media is removing the Hebrew Christian missionary organizations from that webpage and from the entire site. The idea behind JCC is to provide a clearinghouse for Jewish charities. It also allows smaller charities to gain visibility. How? By pooling the advertising dollars of many charities into one highly visible campaign. Jess Dolgin dismisses any questions about using "JCC." He told me to Google it with him. I did. He began to read the listings, skipping the first four listings, all traditional Jewish Community Centers. The email list gathered from the Israel trip giveaway will be used by charities (that pay the JCC) for occasional email campaigns. Dolgin says his company was using the name J Media Group for a long time before they realized the AJPA had a J Media Group. He says the AJPA's J Media Group is not a registered name. (Please contact us if you notice any errors or omissions)"
Moshe Ashin is an Orthodox Jew who said that he got inspiration to develop what he calls the Jerusalem Compass. "I started thinking to myself, wouldn't it be wonderful if the compass could point in a direction that had more meaning to all of us? A direction that was more important. So here we are, the holiest city in the world, the center of the universe and all roads lead to Jerusalem, let the compass point here," Ashin said. The Jerusalem Compass, unlike a typical compass that points north, is designed to point to Jerusalem. "I developed a patented recalibration system and this keeps the needle of the compass constantly pointing in the direction of Jerusalem from anywhere in the world. Just open the cover and it's pointing there," Ashin said. As a way of reminding believers about the significance of Jerusalem, Moshe, an Orthodox Jew has come up with a unique reminder of the eternal significance of the city the Bible calls "the city of the Great King." As we explained on last Thursday's 700 Club, he believes he received divine inspiration to develop what he calls the Jerusalem compass. Overlooking the city of Jerusalem from the Mount of Olives, he told us, "I started thinking to myself, wouldn't it be wonderful if the compass could point in a direction that had more meaning to all of us? A direction that was more important. Where would that be? So here we are in the holiest city in the world, the center of the universe, and all roads lead to Jerusalem. Let the compass point here." Moshe said he developed a patented recalibration system that keeps the needle of the compass constantly pointing toward Jerusalem from anywhere in the world. 1. A novelty item comprising a compass-like device having a housing and a magnetized compass needle suspended therein, said device further comprising a compass face positioned above said needle and hiding same from view, wherein said magnetized needle is rigidly attached, via a linking means, to a non-magnetized pointer positioned in a plane parallel to the plane of said magnetized compass needle above said compass face and angularly displaced from said magnetized compass needle, whereby said non-magnetized pointer always points to a direction other than North. 2. A novelty item according to claim 1, wherein said non-magnetized pointer is angularly displaced from said magnetized compass needle at an angle of about 90.degree. and positioned to always point to the East. 3. A novelty item according to claim 1, wherein said housing is non-transparent except for a transparent top face. 4. A novelty item according to claim 1, wherein the distance between said compass face and the housing top cover is at least twice the distance between said compass face and the housing base. 5. A novelty item according to claim 2, wherein said compass face carries a message of religious significance relating to the direction indicated by said non-magnetized pointer. It will thus be realized that the novel device of the present invention can be marketed in different countries with a pointer oriented to match the direction towards which prayers should be recited. For example, a compass indicating South can be marketed in Finland and Russia, a compass directed towards East can be marketed in the USA and Mexico and a compass indicating West can be sold in India, Pakistan, Burma and Japan. Intermediate directions, for example South-West, would be suitable for Mid-Europe and the UK. In other words, the "compass" always points east, which for many people means they will be praying not toward the Temple, but north or south of it. In the worst case, Jews will be praying with their backs to the Temple. There is no doubt that a more direct and easier to use method [i.e., the new Jerusalem "compass"] would be useful, particularly for less-educated worshippers. However, a search of prior art for such device produced only improvements to North-pointing compasses but nothing relevant to the present disclosure. "Less-educated worshippers," precisely the people who would use the "compass" while traveling in Eastern Europe or Israel and pray in the wrong direction. How's that done you ask? That's Israeli Technology for you... No batteries, No outside energy source, Nothing at all... and it appears to defy nature. Instead of pointing North it will always point to Jerusalem. This compass was developed in Jerusalem over many years, and is patented in the United States. This compass is beautifully crafted from solid brass, and is finished in rich genuine gold, buffed to a mirror finish. 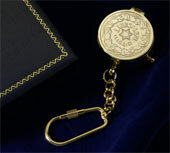 It is also includes a matching gold finished chain attached to the compass. Have you ever found yourself away from home, and suddenly you realized that it is quickly approaching the final time for Mincha? You may be in a car, your office or a friends home. If you are like most people, at best, you will approximate the direction for East, and start davening. But…East is not the direction for Jerusalem. However, it is the direction for China, and Syria! Ashin's patent does not support these claims. I believe that makes ArtScroll (and Ashin) in violation of Federal law. On the Jerusalem Compass website there's a prominently featured database of calibration settings for cities around the world. There is. But nowhere in the text of the front page of the website is it made clear calibration is necessary. I tried this calibration tool. It does not work in the Mac browsers Safari or Firefox. I accessed it using IE. But the results I got were the same for Los Angeles, Saint Louis, Minneapolis, Chicago, Moscow, Tel Aviv, and other cities. All were shown, with their correct name, as being 5124 kilometers from Jerusalem. Each city has the same calibration setting, 046. In other words, for many users the calibration database is useless. Further, the ad copy for the "compass" makes false claims. Without manual calibration for each location, the "compass" will be wrong. No real surprise there. You can click on the images above to enlarge them.